I noticed that my dashboard showed a lot of search terms like, “was Charlton Heston a Christian”, and actually so far today ALL the search terms have had some variation of this question… “It’s a good question,” I told myself. So, not really knowing if he was or not, I decided to do a search of my own. Such as apparently George Clooney thought it was perfectly okay to mock Heston’s revelation that he had Alzheimer’s disease. A Peaceniks view of Charlton Heston’s Activism. I remember my son when he was five, explaining to his kindergarten class what his father did for a living. “My Daddy,” he said, “pretends to be people.” There have been quite a few of them. Prophets from the Old and New Testaments, a couple of Christian saints, generals of various nationalities and different centuries, several kings, three American presidents, a French cardinal and two geniuses, including Michelangelo. If you want the ceiling repainted I’ll do my best. There always seem to be a lot of different fellows up here. I’m never sure which one of them gets to talk. Right now, I guess I’m the guy. 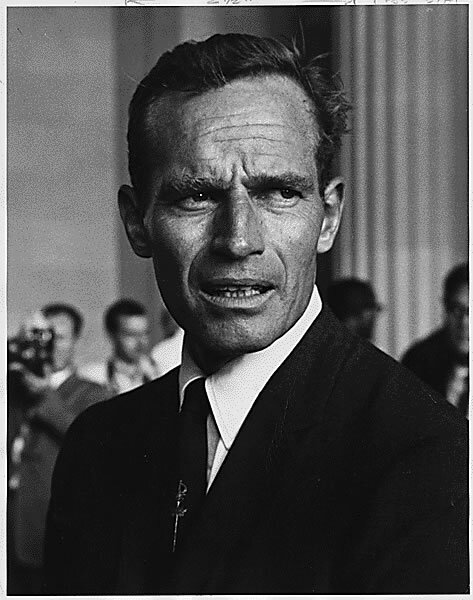 Was Charlton Heston a Christian? I don’t know. But if he was as humble about his own activism and it’s impact on society as I estimate that he was, perhaps he also chose to keep the extent of his religious affections (or lack thereof) under his hunting hat. (Here is a link to the AP story about Heston’s funeral written by Bob Thomas, who apparently was informed by family members that Heston was indeed a devoutly religious man. Another unique look at Heston can be found at Pilgrim’s Planet.